2286 -- Charged and cleared of theft of Enterprise a year earlier with fellow officers Chekov was the navigator on the original U.S.S. Enterprise under the command of James T. Kirk. An only child, his youthful career was so full of brash pronouncements of Russian ethnic pride and accomplishments he became a good-natured joke among his superiors. Although he was always a promising officer with a career to bear it out, the young Chekov was prone to hot-heated actions and romantic attachments. While attending Starfleet Academy his involvement with fellow cadet Irina Galliulin broke off when she dropped out of the service before graduation in disdain for its structure. with Dr. Sevrin were aboard. Following the end of his first five-year mission, Chekov was promoted to lieutenant when he was assigned as security chief aboard the refit U.S.S. Enterprise. Captain Clark Terrell during the Genesis Project incident and Khan Singh's grab for it. For the next few years he remained one of Kirk's trusted officers and stood with the group in the theft of the Enterprise to refuse Spock's body and katra, and then faced the UFP Council when those charges were dropped. 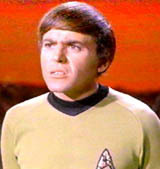 Chekov suffered serious wounds when time-traveling to 1986 during an attempted escape from the U.S.S. Enterprise naval aircraft carrier when suspected of being a Soviet spy of the time. He would have died if left to contemporary medicine, but was saved thanks to McCoy and went on to help secure the Khitomer Peace Accords - followed shortly by his shocked witness to Kirk's apparent death at the christening of the newest U.S.S. Enterprise, 1701-B.